WBNS Columbus news anchor Scott Light, standing to the far right, moderated a GOP candidate debate for the 12th Congressional District primary Saturday at Ohio Wesleyan Unversity’s Hamilton-Williams Campus Center. Sitting at the table, left to right, are candidates Jon Halverstadt, Tim Kane, Melanie Leneghan, Pat Manley, Carol O’Brien and Mick Shoemaker. Troy Balderson, not shown, was to the left of Halverstadt. 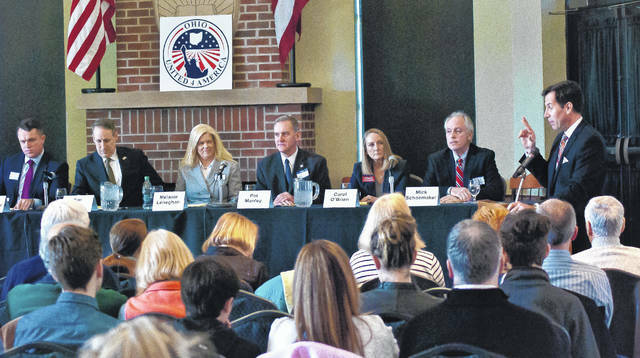 Scott Light, award-winning WBNS-TV Columbus news anchor and host of “Face the State,” moderated a quickly paced debate on Saturday between eight of the 10 candidates running for Ohio’s 12th U.S. Congressional District seat. The event was held at Ohio Wesleyan University’s Hamilton-Williams Campus Center. The debate was sponsored by Ohio United 4 America, a nonprofit organization founded by Holly Adams, Rhonda Ball and Eileen Watts in 2017. All three founders live in the city of Powell. Candidates in attendance were Troy Balderson, Lawrence Cohen, Jon Halverstadt, Tim Kane, Melanie Leneghan, Pat Manley, Carol O’Brien and Mick Shoemaker. According to Ball, candidates were sent the topics prior to the debate, but none of them had prior knowledge of the questions. She said the questions were a collaboration between herself, Light and Kathy Hoskins, an event committee member. Ball said that Light “retooled” a couple of the questions before the debate. Light said since there were so many candidates and time was limited, there would be no rebuttal to any of the questions. Candidates were then given 60 seconds to introduce themselves before starting the debate. Light opened the debate by focusing on one of the most important issues that communities face today — the opioid crisis. Halverstadt said the second wave was the illegal drug Fentanyl that’s coming from China. Halverstadt suggested that people receive addiction treatment once they are arrested or in general when they are coming from off the streets. “We have to enforce our immigration laws and stop funding countries that pour these illegal drugs into our children’s lives,” she said. Manley’s second thought is to crack down and enforce the laws that are on the books against the people providing the illegal drugs. O’Brien: “I’m probably the only person on this stage today that faces this crisis on a daily basis,” she said. O’Brien said local governments need the ability to protect communities. Shoemaker said the American people need to build a wall because “98 percent of all heroin comes across the southern border.” He also said that the prescription database needs to be updated to track who’s getting what and who’s breaking the law. Light continued with questions covering topics of health care dealing with Medicaid expansion and the purchase of prescription drugs from other counties. The issues of maintaining public safety in schools through mental health screenings of children and the selecting of staff for a special response team in case of an active shooter situation, were also discussed. Additional questions focused on the NAFTA trade agreement, immigration, dreamers and DACA. Officials for Ohio United 4 America told the audience that the full two-hour program was recorded and will be going up on the organization’s website as soon as possible. For further information about the candidates and their individual biographies, visit The Delaware Gazette online at delgazette.com and click on the highlighted links provided in the online version of this article to view each candidate’s website. This entry was tagged 12th US Congressional District of Ohio, Balderson, D. Anthony Botkin, Halverstadt, Kane, Leneghan, Manley, O’Brien, Scott Light, Shoemaker. Bookmark the permalink.